This group portrait loosely depicts the Biblical Last Supper, as a large family gathers around a long banquet table for a meal, each member performing a proscribed role. The square, symmetrical room, centered rear windows, and jewel tone color palette refers to that of Da Vinci’s Last Supper and his famous portrayal of the upper room, Jesus, and the twelve disciples. Broken down, the photograph depicts the most crucial foundations of the Christian faith, and the backbone of the Apostles Creed. Seated on the table, a breastfeeding mother represents the anxious, displaced Mary with her new baby. Her contemplative husband sits beside her. On the left corner of the table, a man feasts on a communion meal of bread and wine, pointing to the body and blood, and the crucifixion of Christ. 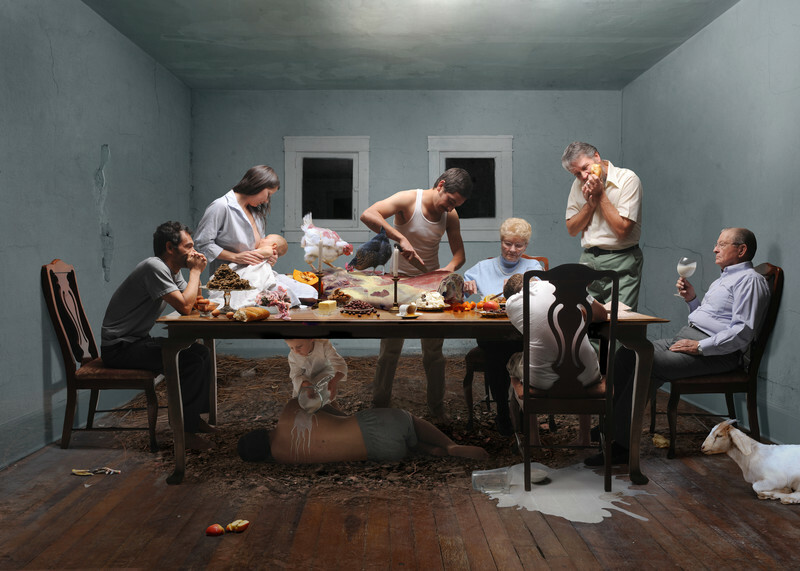 Under the table, a child pours cold milk onto a sleeping man, a picture of the anointing and burial of Jesus. The family eats an Easter Passover meal including traditional Hebrew foods, celebrating the resurrection of Christ. The man in the center cuts a raw fatted calf, derived from the parable of the prodigal son in the New Testament. It is a metaphor for the festive rejoicing of the long awaited homecoming of a loved one, or the return of Jesus Christ. Milk and honey spill onto the table and floor, referring to Moses’ Heaven in the book of Exodus, the Promised Land. The human subjects function much like the personified objects in my other works, serving as handsome surrogates. In this piece, they represent my own family. I imagine my sister in law is seated on the table bearing a miracle child, and my brother sitting beside her. My father cuts the fatted calf. My mother is the peaceful woman observing and pondering everything in her heart. My grandparents, the detached man seated to the right. I am the one lying under the table.